I am a descendant of the Wangkumara and Muruwari people of Northwest NSW, of the Flinders Rangers, SA, the Kooma of Southwest QLD and the Baakindji – Kurnu and Kunja people of Northwest NSW. I have been team – teaching in Modern Australian History, and Family and Community Histories in the School of Humanities at UNE for 12 years. I have always found UNE to be an enjoyable place to work, where ideas and new ways of doing research, particularly with Aboriginal people are not only encouraged but supported, especially within the discipline of History in the School of Humanities. 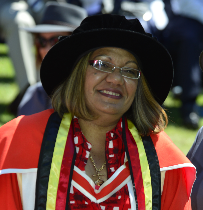 I was conferred my PhD at the UNE Spring graduation ceremony in October 2014. My PhD research focused on family/community history and the oral traditions of the Weilmoringle community. My thesis is titled Ngarraka Yaan: A Murdi History of Weilmoringle. I am passionate about family/community history and specialise in oral history and am particularly interested in the way in which Aboriginal history has been recorded. More importantly, my main interest is in the process of remodelling research methods and techniques so that they readily apply to and are culturally appropriate and accessible to family/community, who are the core audience for my academic research and creative arts project. If you have an interest in this area and would like to know more please feel free to contact me.